Whenever the poet George Mackay Brown reorganised his library, getting rid of some of the overspill, some books from younger years would always remain. There was the first Penguin book from 1935, a biography of Shelley by André Maurois; and Penguin number 3, Poet’s Pub by Eric Linklater. And there was also a book on cosmology, published in Pelican Books in 1940. The wartime paper is thin and the pages became dog-eared, but it was kept with care. 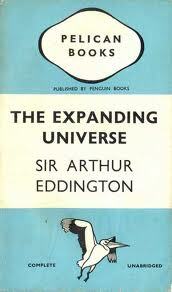 In The Expanding Universe, Sir Arthur Eddington described the new picture of the cosmos. He described the measurement of the distances of spiral nebulae and the red-shift of the light which shows that they are moving away from us, and he explained how the theories of Albert Einstein and Willem de Sitter had produced a model which fitted the observations. Throughout his life GMB was in general not often impressed by the explanations of popular science. Too often, he thought, they did ‘nothing to satisfy the perennial human hunger for what is true and good and beautiful’, failing to go deep into the great mysteries such as Time. He sought something more than that, something with more of the sense and exploration that he found at the age of eight when he read science fiction stories in the Wizard and wrote his own ones. The story of these and much else can be found in the finest introduction to his life and work, Interrogation of Silence by Rowena Murray and Brian Murray. Coming through the book, clearly and lyrically, is a picture of how he saw life as a journey in search of something – insight, experience, illumination. he wrote in the collection Following a Lark, which appeared in print just days after his death in April 1996. ‘I have picked up a few curious things from the shore of the great ocean of time,’ says a character in one of his novels. Eddington had a remarkable combination of skills. He could focus on specifics with great lucidity, explaining radical new developments in physics in language that was clear and simple and went to the heart of a concept. And at the same time he did not shrink back from the wider implications of the ideas. The territory that he took the reader into could verge on the mystic, but the steps there were disciplined and scientific. ‘For the truth of the conclusions of physical science, observation is the supreme Court of Appeal,’ he wrote. He was born in 1882 in Kendal, Cumbria, and he was not yet three when his father died during a typhoid epidemic. His mother had to bring up her two children with little income, but by the time he was sixteen Eddington had won a scholarship to the college that would become the University of Manchester. He went on to further study at Cambridge and employment at the Royal Observatory at Greenwich. In 1913 he became professor of astronomy at Cambridge. 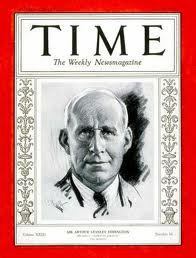 Eddington was the first person to develop a real understanding of what goes on in the heart of a star. He built on Karl Schwarzschild’s model of a star as a gas held in a balance between the attractive force of gravity and the heat bursting outwards. He calculated the pressure and density of this stellar gas – and its temperature, which he showed was millions of degrees. For the source of this colossal heat, he turned to the new developments in nuclear physics of the time, in particular nuclear fusion. Light-rays, when near the Sun, DO NOT GO STRAIGHT. 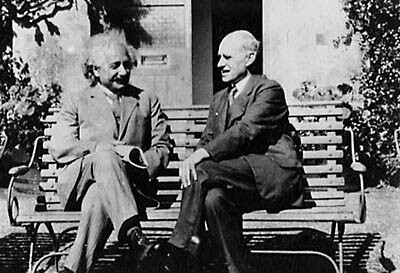 Eddington had been early to recognise the significance of general relativity, which had been published in 1915 at a time when many other British astronomers were arguing that links with German colleagues should be broken. 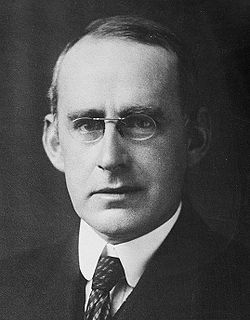 Eddington, whose parents were Quakers, was a pacifist and repeatedly called for British scientists to keep up pre-war friendships and scientific contact. He was also a conscientious objector, and indeed it was only the intervention of the Astronomer Royal and others that kept him out of prison in 1918. He was widely regarded as the best exponent of relativity, and Einstein reckoned that his book The Mathematical Theory of Relativity (1923) was ‘the finest presentation of the subject in any language’. A number of his concepts and phrases have become part of our culture, among them ‘time’s arrow’ for our one-way experience of the passage of time from past to future. It was also Eddington who popularised the French mathematician Émile Borel’s concept of the infinite number of monkeys on typewriters producing a library of books. Eddington himself, a keen cyclist who once covered the 122 miles from Doncaster to Cambridge, devised the Eddington number which records the number of days in your life on which you have cycled at least the same number. His own E number the year before he died was 77. (In other words, on 77 days he had cycled more than 77 miles). Some of the territory he explored still needs further investigation, in particularly the work on what he called ‘fundamental theory’, an attempt to unify quantum theory, relativity, cosmology and gravitation. The work was uncompleted at the time of his death in 1944, but a book Fundamental Theory was published posthumously. This exploration took him forward into deep questions about the nature of reality. And to find out what that stuff of the world was, he said, part of a shared quest. In an obituary, Time magazine which had featured him on a 1934 cover, spoke of him as ‘one of mankind’s most reassuring cosmic thinkers’.